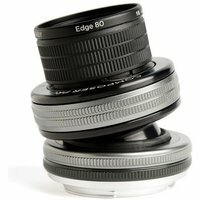 A part of the Lensbaby Optic Swap system, the Lensbaby Composer Pro II with Edge 80 Optic is an 80mm f2.8 lens with a 12-blade adjustable aperture. By tilting the lens in any direction, you can get a slice of focus through your image  similar to the tilt effect in a tilt-shift lens. Round, smooth bokeh fills the out-of-focus areas. The Composer Pro II has several improvements on its predecessor.